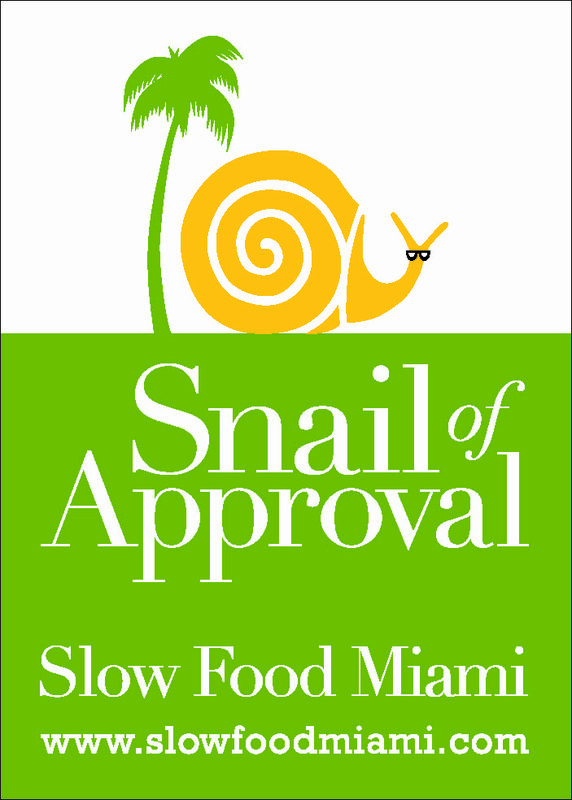 At Tuesday night’s private dinner to celebrate the induction of the Hua Moa banana-plantain into the Ark of Taste, Slow Food Miami Leader Donna Reno surprised Michael and the MGFD team with the chapter’s first-ever Slow Food Snail of Approval. Not unlike the Good Housekeeping Seal, it certifies restaurants, bars, food and beverage artisans, and stores and markets as genuine contributors to the quality, authenticity and sustainability Miami’s food supply. They even call our references to see if we check out, as they should! It’s a much needed program, especially for interested consumers, to ensure that those establishments taking a big local game back it up in practice. We are very proud to be the first in South Florida to wear this badge of honor and look forward to welcoming other restaurants into the fold. It’s not easy being green, but that’s kind of the point, right? View our Flickr set of the prep and meal here, and the menu after the jump. I’m still dreaming of that meal! sustainable product and supporting the folks that produce this. dedicated her life to advocating this and so much more. Congrats, Michael et al! Lovely to get such recognition for your efforts. I once, many years ago, had a snail award of my own — for winning the Escargot Eating Championship of Dallas, Texas, back in the years when I was an editor with The Dallas Morning News. The competition lasted 15 minutes and there were about 50 competitors. The escargot were served in the shell, plated a dozen at a time, and kept on coming — guess how many I managed to eat — and I’ll tell you my winning secret when next you’re in Cayman.